Very few of us these days are getting enough sleep. But it’s easy enough to get used to waking up tired and grinding on into your busy day. And so we go on doing it, day after day, night after night. It doesn’t need to be like this. In the previous century that was the message from the pharma companies. But we’ve begun to realise that—except in clinically serious cases of insomnia—drugs are probably not the answer. So now it’s the turn of the gadget providers. Fitness devices are springing up all around us. And there are apps on our phones to quantify our sleep and ensure we move about enough each day. And here, arriving at Tested Technology as an unexpected Christmas delivery, is a dedicated sleep device for our bedside table that manufacturer Philips says “is designed to help you relax and wake up refreshed”. I’VE BEEN A HUGE FAN OF THE DUTCH manufacturer Philips. In the mid ’50s I persuaded my family to buy an early Philips reel-to-reel tape recorder, which launched me into a life-long love of audio. Over the years I’ve used and relished the company’s toothbrushes, shavers, radios, light bulbs, cassette machines and food mixers. I’ve cooked, shaved, listened and recorded with Philips. Back in the ’60s, I even appeared on stage at the Royal Shakespeare Company’s Stratford theatre with one of the first Philips battery cassette recorders sneakily strapped under my armpit in a leather holster specially made for me by a girlfriend in the costume department. But that was then, and this is now. Do Philips’ current products merit the same enthusiasm? 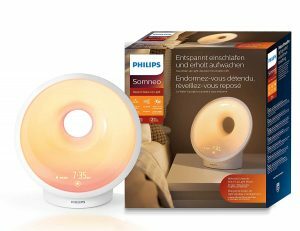 A surprise delivery from Philips introduced me to the Somneo Sleep and Wake-Up Light. Around this time of year, lucky journalists often get sent goodies out of the blue. I’d asked for a Philips razor to review alongside a rather good clipper recently donated to Tested Technology by Wahl, and the Somneo was bundled in with the delivery. What Does the Somneo Do? The full name of the product, the Philips Somneo Sleep and Wake-Up Light tells the story. The product is intended to help you relax before you go to bed and wake you up next morning refreshed and ready for the day. The sales literature speaks of “light-guided breathing and personalised sun risings and settings”. Based on some standard belly breathing and relaxation exercises, the Somneo by your bedside in the evening is programmed to deliver up to seven different rhythms of light intensity or sound. With your eyes closed, you can adjust your breathing in time with these audio or visual cues, decompressing, as the promotional text explains, “for a calm and peaceful transition from your day to your dreams”. When morning comes, the Somneo reverses the process, slowly edging into your consciousness. Emulating a sunrise, its light panel gradually brightens during the run-up to whatever appointed wake-up hour you’ve set. The glow changes from red through orange, “until your room is filled with bright yellow light”. That last bit sounds like sales bumpf again. My first thought was that if your bedroom is the size of a small inside cabin, the Somneo could probably have it brimming with pseudo-sunlight by the time you open your eyes. But as this is essentially a medium-sized bedside lamp, I doubted it had sufficient Nits* to “fill your room”, particularly if dawn has already broken. But it turned out I was wrong about this. See below. *These “Nits” are units of luminance, a measure of light emitted from a square metre of the source. Optionally, the waking process can be accompanied by the swelling twitter of birds, the natter of the Today programme from the internal FM radio or, if you can figure out how to make your phone switch on at the right time, your favourite tracks played into the Somneo though the 3.5mm aux socket. 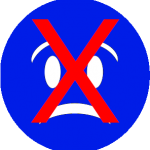 SAD, or seasonal affective disorder, is a mood dysfunction typically associated with winter. It’s known that the shortage of natural, full-spectrum light can have a profound, depressing effect on some people with otherwise normal mental health. Problems with sleep are a known symptom of SAD. At its worst, the disorder can manifest itself in a sense of personal worthlessness, with loss of interest in activities and even thoughts of suicide. Devices to address SAD closely resemble Philips’ Somneo. They are large bright light panels designed to simulate daylight, leaning towards the blue end of the spectrum. But Philips makes no mention of SAD in its promotional material or the instruction booklet. In fact, the light emitted by the Somneo tends to be warm, more orange than blue, emulating sunlight rather than daylight. 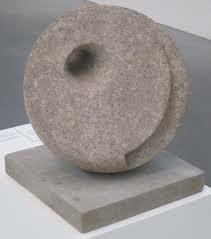 This is not to be mistaken for a SAD device. The first thing that may strike you about the Somneo is the industrial design. The circular light panel has, for no very good reason—or any discernible reason at all—a hole in the middle. Perhaps inspired by the sculptures of Barbara Hepworth, the net result is reminiscent of a melting, Daliesque version of a Dyson Cool fan. You may also wonder at the cheaply implemented FM-only radio with its setting limited to five stations. The aerial is a metre of thin white wire tailing out of the back of the device that you’re presumably meant to Sellotape to the wall. The last time I needed to do that was in the early 1950s when I was setting up my crystal set radio. Somneo Rear Connections. The USB socket will deliver 1000ma to charge your phone. Then there’s the poor selection of sounds you can get out of the device. The best of these, the birdsong, seems to be underpopulated and on a tight loop that quickly reveals itself as a repeating pattern. The sound from the machine’s small rear-facing speaker is acceptable for speech but not much help for listening to music—it’s noticeably worse than the average kitchen radio. 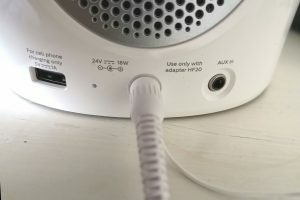 A device like this—particularly at the price demanded by Philips—could be expected to have Bluetooth (so that it could be quickly programmed from your phone) and wireless connectivity to your LAN, giving it a limitless selection of wake-up sounds and allowing it to join an IT ecosystem like Amazon Alexa or Google Home. But neither Bluetooth or Wireless LAN is provided. I don’t have much need for the belly breathing exercises at night as I usually get off to sleep easily. But for a late afternoon wind-down following the working day, letting the crashing surf sounds from the Somneo dictate your breathing is a very pleasant way to spend ten minutes or so. Another bedtime option is Sunset Simulation, where the Senseo starts with bright white sunshine and gradually sinks through orange to a dark red before shutting down altogether. If you’re using the radio, a feed from the Aux socket or the sound of rain, this will fade with the illumination. 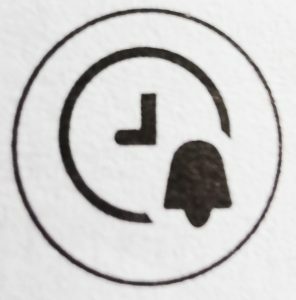 “The default duration of the wake-up curve,” says the manual, referring to the length of time to reach maximum brightness, “…can be changed to your preference.” But the symbol displayed here seems only to change the time of the alarm, leaving me stuck with the default 30 minute wake-up curve that brings me to full wakefulness about 15 minutes before the little birdies start to cheep. For the morning reveille, yes, I need all the help I can get. My usual pattern is to wake up grumpily to the beep-beep of my Lexon Flip alarm at around 6:00 am, snooze it for five minutes, then grudgingly allow consciousness to seep in as I squint at my phone, sniff around my social media and eventually try to make some sense of the coming day. This morning was different. A warm orange glow from my bedside table slowly whitened into bright sunlight. At the appointed hour of awakening, I became aware of birdsong—that’s Twitter with a lowercase “t”—swimming sweetly into my sensory system. The pseudo morning sunlight did indeed “fill the room”—enough to set me up for an optimistic morning mood. I felt I’d slept well (although only for five and half hours, as my Quantitative Self analysing gadgets told me later) and was more than ready to carpe the diem. So this thing—despite its design and implementation shortcomings—can work rather well. The Somneo is an interesting product in a useful product category. But without Bluetooth, without Internet connectivity and with merely an FM radio, it seems very much like a product of the 20th century rather than this one. Philips has set the recommended retail price for this HF3651 version with FM Radio at £189.99 but I’m not surprised to find it discounted down at Amazon UK to around £150. In my view, that’s still a lot of money to pay for a nice idea put together with rather poor design sense.